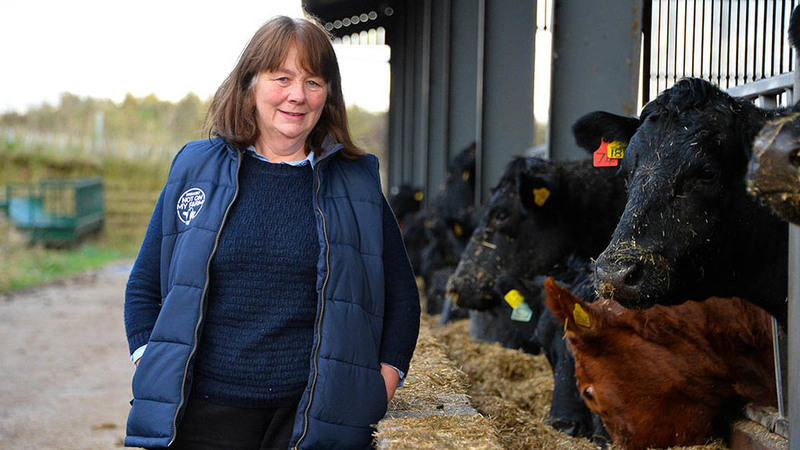 We spoke to Fiona Skeen of Ford and Etal estate about why she runs a mixed farm. Fiona Skeen and her son Graeme run a mixed farm on Ford and Etal estate, where their family has farmed for over 90 years. With sheep, a beef suckler herd and arable to manage, we spoke to Fiona about why she runs a mixed farm. “A big benefit for us is by growing crops, it saves us so much money on straw as I don’t keep my cattle on slats. We put muck back out on the fields cutting down on artificial fertiliser – and exchange our excess muck with an all-arable neighbour for extra straw which works well for both of us. “From my experience, cross-grazing sheep and cattle produces healthier stock. For example, sheep eat host-specific worms for cattle and vice versa, reducing the overall worm burden on the pasture. “We also see it as an advantage for pasture management. Sheep will eat the rubbish cattle won’t, like ragwort in its early stages. Cattle are much more selective grazers. More sustainable – you can reduce the need to buy in fertiliser and feed by producing your own. A more predictable income by having multiple streams of revenue should one market suffer. Poor economies of scale when compared to intensive farming. Increased workload and managing multiple systems. It requires thorough organisation and planning – and a good eye for detail when planning your biosecurity measures. 500 ewes, lambed inside in February.